Here is a stupid (as in simple-minded) thought; this year has a different name than last year, or next year. This year is named 2012. All of the news of the past twelve months will have the surname 2012. Personal events will be tagged with 2012, a school graduation, a marriage, a birth. Gravestones will show an expiration date of 2012. All the sins, each of the noble acts, and everything in between, it’s all done. Lies were perpetrated; truth was told. Life was lived. For me, 2012 combined endings with “back to school.” Completion and reinvention, something we do with each year, with each day, with each thought. 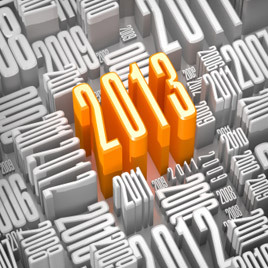 This year is named 2013, and 8760 hours of it will be spent in some way. Try this: It is not a resolution, those tend to fizzle in a few days or weeks. Instead, dream a little dream of 2013, then set it aside. Here’s how to start. Take yourself forward to next new years eve, when 2013 is being put to rest. There yet? Take your mind there before reading on. Now, from December 31st, 2013 take a moment to review; what were the top news stories of your life in 2013? What was important; what stayed constant; what changed?